While neighboring Greece has its beautiful beaches, wonderful sunsets, and ancient ruins, the country of Turkey has its awe-inspiring natural landscape formations, a colorful and lively culture, and an eclectic mix of the Greek, Roman, and Ottoman structures. An all inclusive holidays to Turkey vacation boasts diversity when it comes to tourist attractions and holiday destinations and if you are looking for a vacation full of adventure and fun, it’s the place to be. If you are looking for an Indiana Jones type of adventure then the site of one of the greatest wars in ancient literature must be your first stop in Turkey. Once thought to be a mythical place, the archaeological site of Troy that was excavated in 1865 is now a UNESCO World Heritage Site. Due to the many civilization and empires that took over Turkey in ancient times, Troy has a number of archaeological layers. The layer named Troy VII is, based on findings of several scientific studies, identified to have been the city that inspired Homer’s Troy. Leave those fancy shoes at your hotel room and put on your hiking shoes. 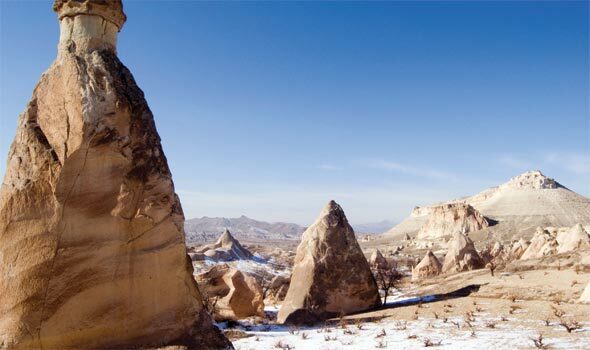 Cappadocia, after all, is nothing if not for its exceptional natural rock formations. An ancient region of Anatolia in Turkey, Cappadocia is famous for beautiful conical rock formations called fairy chimneys, its troglodyte dwellings, and its underground cities. When you are in the midst of all these, it truly feels like you’re in another planet or you’ve gone back thousands of years back in time. Additionally, if your feet get too tired of exploring yet you still couldn’t get enough of the landscape, you can always see everything from above in a hot air balloon. Nature has bestowed upon this town in the western part of Turkey. 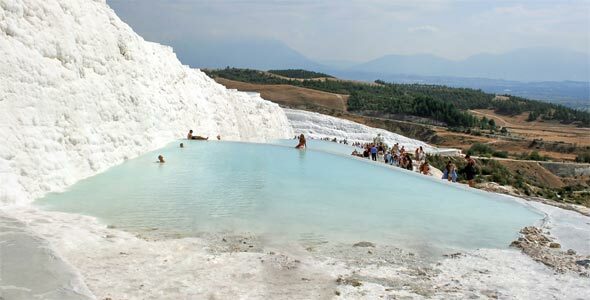 It features breathtaking petrified calcium terraces with pools of hot springs that people can bathe in. These calcium terraces called travertines are truly a natural wonder that is worth a visit. Smaller, underground versions of the travertines are the Kaklik caves, which are a good 30 minutes away. Closer to town is another natural wonder, the hot mineral waters of Karahayit whose autumnal colors are a sight to behold. If you are looking to take a break from your adventurous vacation, head to Pamukkale. The town also boasts some historical sites like the larger than life Roman amphitheater of Hierapolis and the biblical location of Laodikya. The city of Istanbul is probably the most vibrant and the liveliest city in the world when it comes to its people, its culture, its history, and its architecture. Here, you will see the best testament of the empires that ruled Turkey. Evidences of the Greek, Roman, Byzantine, and Ottoman civilizations are found all over Istanbul and their magnificent architectures beautifully decorate the city’s night skyline like Christmas lights. Take a day or two to learn about Istanbul’s history through its basilicas, churches, mosques, castles, and palaces and don’t forget visit Dolmabahçe Palace’s world-famous double horseshoe staircase made of Baccarat crystal. There are still plenty of places to discovery in Turkey like the ancient city of Ephesus, once the site of the Temple of Artemis, one of the Seven Wonders of the Ancient World; the Sumela monastery, which is hanging on the face of a really tall cliff; and the ancient city of Pergamon, once the site of the Altar of Zeus. Turkey is truly the place to go if you are looking for an adventure away from home.